Something happened in the United States during the 1970s. According to a number of indicators, well-being of the majority of Americans, which had been growing for many decades, entered a regime of stagnation and, eventually, decline. The trend towards greater equality in incomes and wealth was reversed. Social cooperation within the political and business elites, and between elites and the rest of the population began unraveling. As intraelite fragmentation and conflict increased, the American political system became increasingly more dysfunctional. By the election year of 2016 the trends of declining well-being and elite fragmentation have become glaringly obvious. One only needs to look to the surging presidential campaign of Donald Trump (and, to a lesser degree, that of Bernie Sanders). At the same time, the deep structural forces driving both the long-term negative trends and their culmination (so far) in the 2016 presidential campaign, are not understood—neither by the public, nor by the politicians, nor indeed by the social scientists. 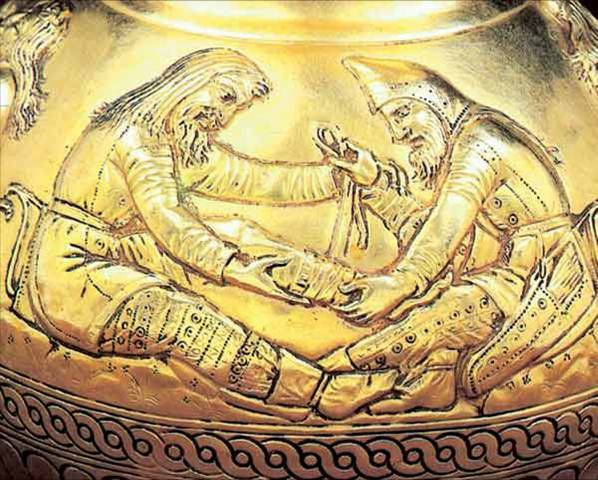 In fact, what we see today in the United States is a general social dynamic that all complex societies share, ever since they arose some five thousand years ago. 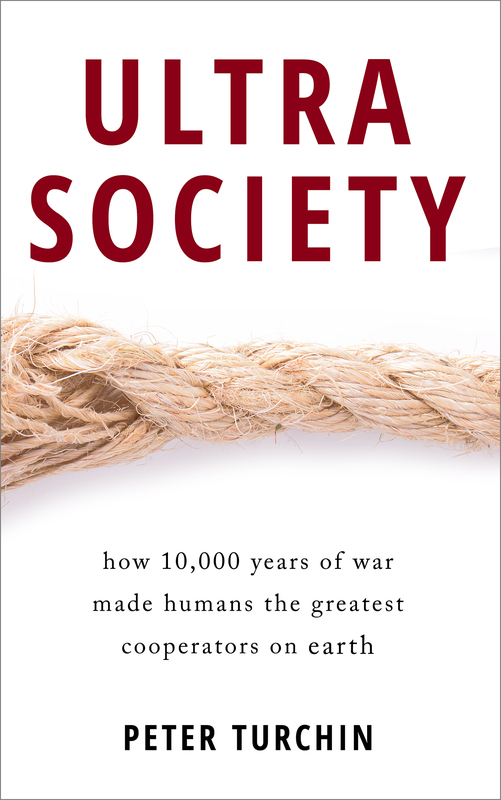 As we explain in Secular Cycles, all large-scale complex societies experience periodic waves of political instability. Although the US today is very different from, for example, Late Roman Republic, the structural-demographic forces driving political instability—popular immiseration and intraelite conflict—are the same. We call such periodic waxing and waning of political instability Secular Cycles because each cycle consists of two secular trends—a positive (increasing popular well-being, internal peace and order) and a negative (declining well-being, growing political instability that often culminates in a civil war or revolution)—each roughly a century long. The peak of the previous wave of political instability in the US was the American Civil War (1861–65). Today all the structural-demographic indicators are trending in ways that signal an impending crisis—just like they did in the 1850s. It doesn’t mean that a political crisis on the scale of American Civil War is inevitable. On the contrary, for the first time in human history we actually have a pretty good understanding of how and why previous outbreaks of political violence occurred. Furthermore, we also have a number of examples when historical societies managed to navigate through structural-demographic crises by adopting the right mixture of political responses and social reforms. We can, and should, use our understanding of the causes of instability waves and the successful (if rare) examples of avoiding massive outbreaks of political violence in history. Over the last years I have amassed a large amount of data on many different structural-demographic indicators. As I just said, they all trend in ways that should make us take notice. The purpose of this web resource is to present both summaries of these trends and the rich data that underlie them. My goal is to show that structural-demographic theory makes sense of this bewildering variety of demographic, economic, social, and political data. This is the first step. The next one will be to use the theory to navigate through the impending crisis without piling up hundreds of thousands of corpses, which is what happened in Age of Discord I. 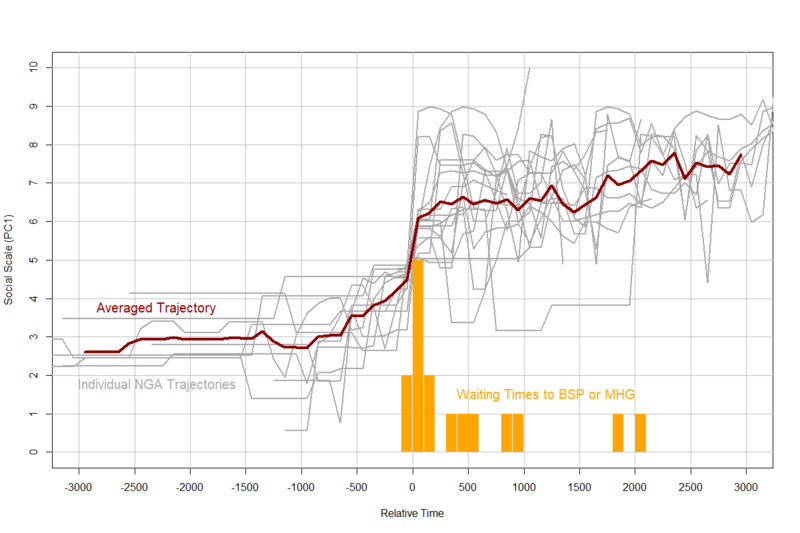 The black line shows the number of “instability events” (in which at least one individual was killed) for each of 5-year periods between 1780 and 2010. Colored lines break it down by the type of event: riots (brown), lynchings (blue), and terrorism (green). The last category includes both indiscriminate mass murder (by bomb or gun) and assassinations targeting political leaders. There are several peaks in the graph, which tend to recur at roughly 50 year intervals (the violence spikes in c.1970, c.1920, and c.1870). More importantly, you can see that the background level of political violence (abstracting away from the spikes) tends to wax and wane in slow waves. Following the American Revolution, which ended just before the start of this sequence, violence gradually declined, reaching a minimum in 1820. Between 1820 and 1860, however, the level of violence rapidly and dramatically increased. The period of 1860–1920 had two spikes of violence, one associated with the American Civil War (1860–65) and the other with the Violent Teens of the twentieth century. But between the two spike the general level of violence did not retreat very far. The decline of the underlying violence trend, and a very dramatic one, took place after 1930s. By 1950 the number of instability events declined to one-tenth of the 1920 level, ushering in the second peaceful spell in the American history (after 1820). This long cycle of political violence, from the peaceful 1820s to the peaceful 1950s, is an example of a political instability wave. 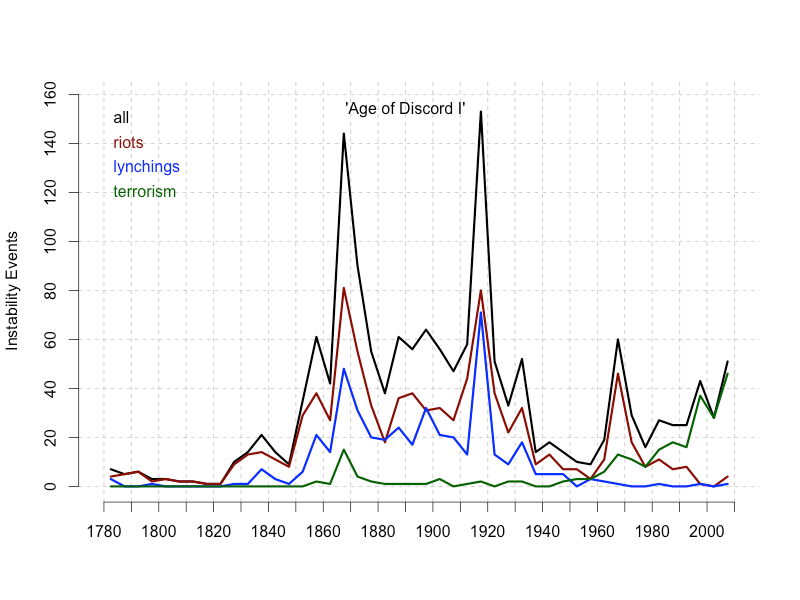 Other societies, from Rome to medieval and early modern England, France, and Russia, show the same pattern of slow (roughly, century-long) waxing and waning of political violence, with 50-year spikes on top (this is all covered in our book Secular Cycles). We also see that the whole period between 1860 and 1920 was a very violent one, not just the 1860s. Of course, the sheer scale of Civil War’s casualties is unmatched in American history. But the years around 1920 saw many different kinds of violence outbreaks—race riots in 1919 that killed many hundreds of people, anarchist bombings, a popular insurrection of thousands rifle-armed miners in West Virginia, and many others. Let’s call these six decades of turbulence in America “Age of Discord I”. Note also that after 1960 the curve again began trending up. The spike around 1970 came and went, but the basal level of violence continued to increase. Should we worry about “Age of Discord II”? To understand whether such fears are well-founded, or not, we need to look to the two structural-demographic forces that have been implicated in previous outbreaks of political violence—popular immiseration and intraelite conflict. Population well-being (and its inverse, popular immiseration) has many dimensions. 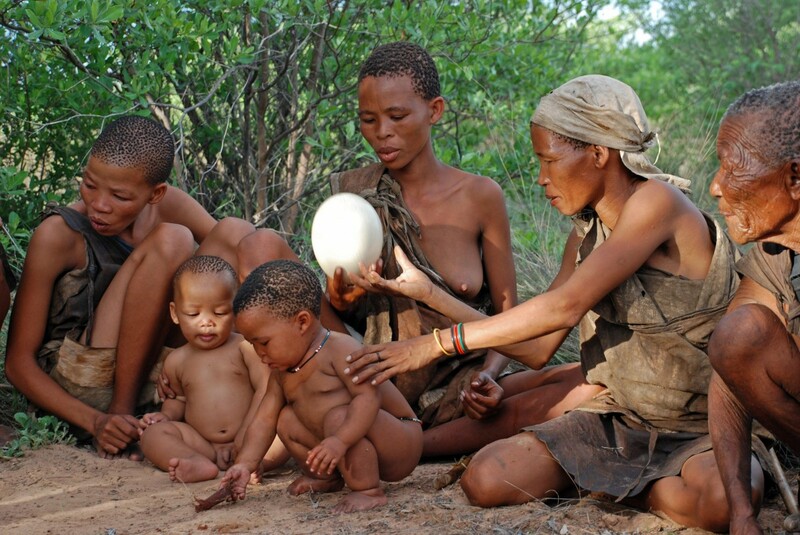 Here I focus on the economic, biological, and social aspects of well-being. My approach is to look for “proxies”—variables for which we have data and that are correlated with the entity of interest, in this case, well-being. On this overview page I made a further selection: I chose proxies that indicate how various dimensions of well-being changed throughout the whole life-span of the American Republic. Other, specialized, pages will delve into each of these variables in much greater detail, and pay more attention to the latest trend reversal. I will bring more and different kinds of data to show that the proxies selected here agree with other similar variables. In other words, the trends shown in the following graph are real; they faithfully reflect the long-term changes in the fundamental aspects of American quality of life. The graph below shows the trends in four well-being proxies: employment prospects, wage relative to GDP per capita, health, and family (explained further on Dimensions of Well-Being). It is obvious to the naked eye (and statistical analysis supports this) that all proxies go up and down roughly in synchrony. The thick grey line (PC1) highlights the overall cyclic trend shared by the four indicators (in technical language, PC1 is the first principal component). 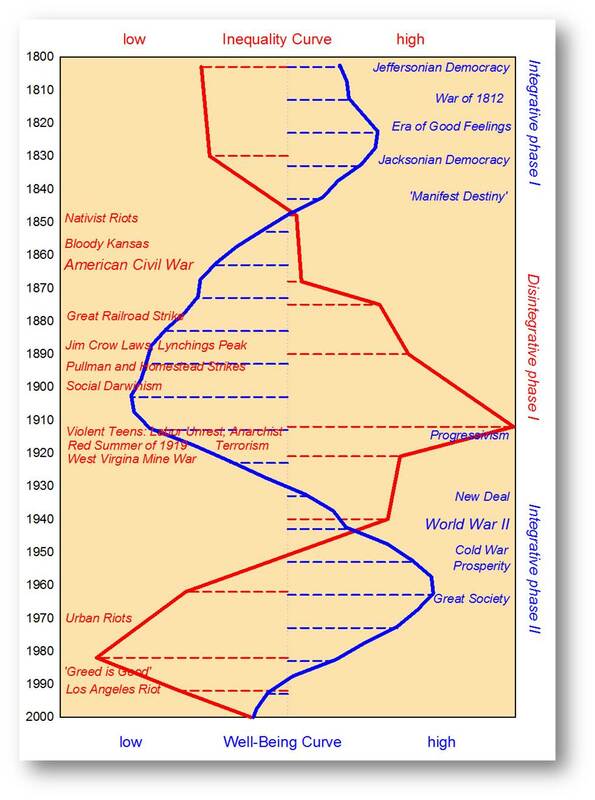 Over the course of American history population well-being went through two cycles. It trended up until 1830 and then rapidly declined to 1860. 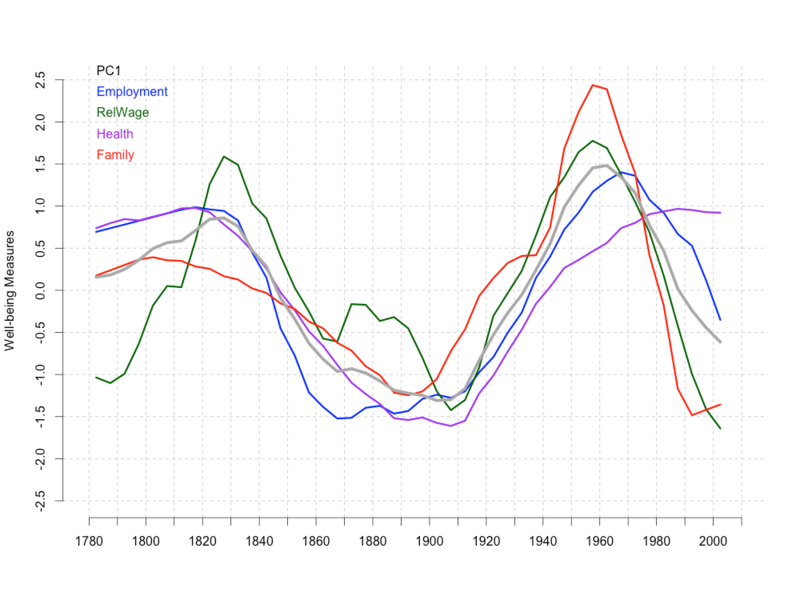 Between 1860 and 1910 the downward trend continued, although at a slower pace. This is when well-being was at the lowest level in American history, and it would not be an exaggeration to characterize this period as “popular immiseration” era. The second cycle began in 1910. 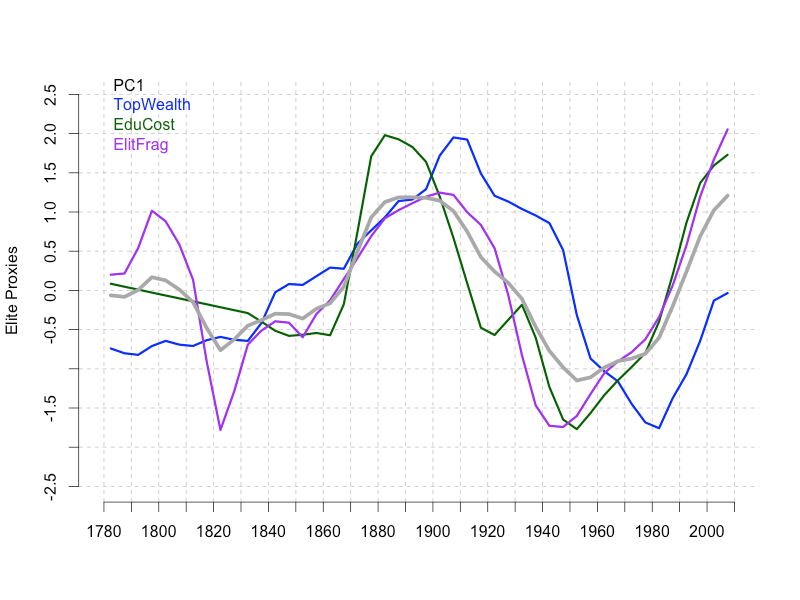 Between 1910 and 1960 American well-being increased at a truly remarkable pace, reaching unprecedented heights during the post-war era of “prosperity”. After 1970, however, another downward trend set in—one in which we happen to live today. We are not anywhere near the level of immiseration that we saw in the second half of the nineteenth century. Additionally, one indicator (Health) did not decline in the post-1970 period, merely stagnated (but as we will see on the Health page, recently biological well-being indicators have started declining for some segments of the American population). The overall trend towards immiseration is very worrisome, especially because it is broad-based (see page under construction). It’s especially worrisome because the previous immiseration period almost perfectly coincides with the period of social turbulence and political violence, which I have termed Age of Discord I (1860–1920). The question is, if popular immiseration continues to increase, will we end up with a repeat—Age of Discord II? TopWealth is the size of the largest private fortune scaled by the annual income of a typical (median) American worker (proposed by Kevin Phillips in Wealth and Democracy). It’s a proxy for both the levels of top fortunes and the numbers of top wealth holders (see Elite Overproduction: Numbers of Top Wealth Holders). EduCost is the price of attending an elite university (Yale) scaled by the income of a median American worker. It’s a measure of intraelite competition for elite education (because intense demand for a product drives up its price). See Elite Overproduction: Demand for Advanced Degrees. ElitFrag is a measure of intraelite fragmentation and conflict, proxied by party polarization in the Congress, developed by McCarty, Poole, and Rosenthal (see their book Polarized America). The thick grey line (PC1), again, captures the dynamical trend common to the three separate proxies. The two curves are nearly mirror-images of each other. 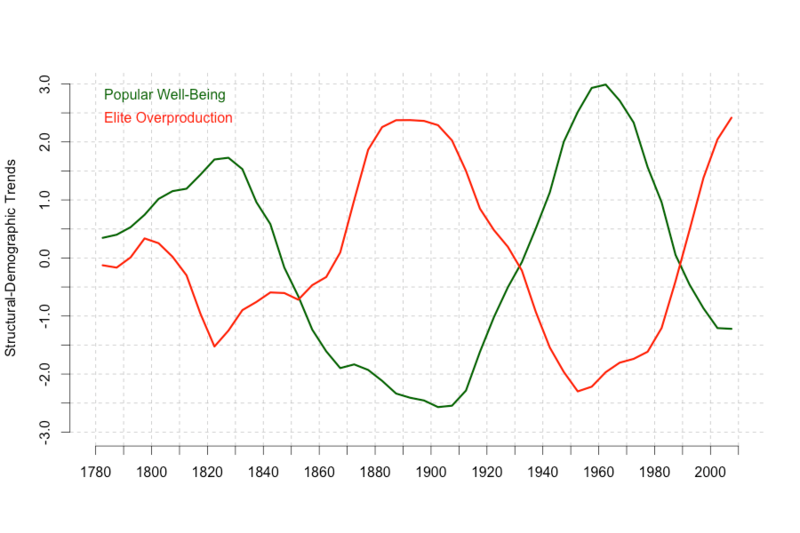 When elite overproduction is high, popular well-being is low, and vice versa. There is no circularity in this pattern—each curve is based on separate proxies. Very different social indicators—age of first marriage, average population stature, price of university education, the level of top fortune, polarization in Congress—all of them appear to be interrelated. And they are interrelated precisely as predicted by the structural-demographic theory. Here political violence is quantified by the number of people killed in instability events, divided by the US population (the variable is then log-transformed, see my article in the Journal of Peace Research). 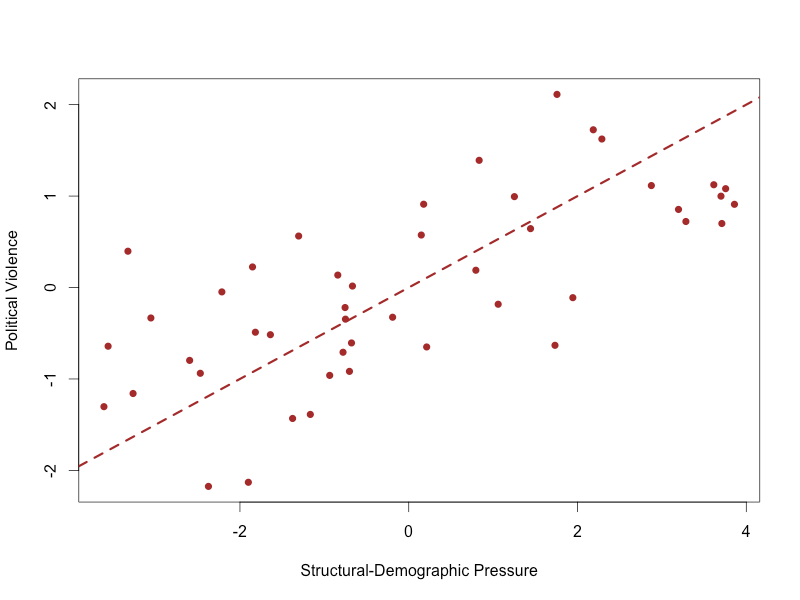 Structural-demographic pressure is the common trend of all well-being and elite overproduction proxies (the first principal component, it is negatively correlated with well-being and positively with elite overproduction). There is a clear relationship in the plot: the greater is the structural-demographic pressure, the more political violence.